Blogophilia 50.2 Topic: "To Make a Long Story Short"
Today I got a mediocre book review. I say mediocre because it wasn’t totally bad. There was actually a lot of good stuff in it, and the reviewer isn’t suing me to compensate her for the lost hours of her life, so that’s something else good. In fact, as far as “bad” reviews go, I can’t even qualify it as such, that’s why I say mediocre. It’s not the mediocre quality of the review that was the real issue, though, but the fact that it was my first review from an independent review site (PODBRAM) and THEN it was mediocre, see what I mean? I like to take a sixth approach: I use it as an excuse to have a vacation day. Of course, I’m still reluctant to take those hours off. I started out doing blogspot and wordpress and email, and then hubby popped up from his Evony game and asked if I wanted to go to town with him. That’s when I decided that yes, indeed, I was moping and I was going to do it properly! No, I wasn’t going to go buy a bottle of Vodka and a pack of Marlboros and drown my sorrows, I was going to buy a Frappuccino and a box of chocolate muffins and watch a movie. So, we went to wal-mart, and thus began the quest for the chocolate muffins. What kind of chocolate muffins? I didn’t care; the mini muffins, the weight watchers muffins (those are good, btw! ), the grandma oskersnicklemitch’s muffins; it didn’t matter! But, and here’s the odd thing, there were NONE! There were places for chocolate muffins, but no chocolate muffins. Not a problem, of course, because the bakery department would have them. Wrong! That’s when I decided that brownie bites were pretty close to chocolate muffins, so we could get those instead, only, guess what? No brownie bites! Wal-Mart was completely devoid of chocolate muffiny goodness! So, we did the logical thing. We checked out, then headed to Wood’s grocery store, where the prices are higher, but we could find chocolate muffins. Surprise! No chocolate muffins! Like Wal-Mart they had blueberry muffins, apple cinnamon muffins, banana nut muffins, streusel muffins, heck, even raisin bran muffins, but no chocolate muffins! Not even in the dieter brands! What in the world?! Where are the chocolate muffins?! At this point it was no longer a matter of whether I was moping or not, it was a quest! It was the principle of the matter! 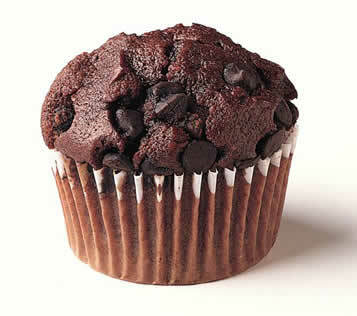 I was going to have a chocolate muffin, dammit! And yes, I know I could have BAKED it myself, but then it wouldn’t have that slick, moist texture that only a fake, bad for you snack cake has! Besides, that would be like surrendering. Then, at the new Kum n Go, what do I see but the last chocolate muffin in Bolivar! I grabbed it and, though I refrained from kissing it, I did do a little jig in the aisle. The hour of searching was rewarded at last! Hooray! So, we come home, muffin and frap in hand, and begin the “What movie do you want to watch” discussion. If you’ve never had it, it’s just like the “what do you want for dinner” conversation, only longer because there are way more choices. To make a long story short, Hubby’s suggestion was “The Uninvited” while I opted more for the cheerful “Chicken Little”. In the end we went with Blazing Saddles. Now, this sounds perfect, doesn’t it? A classic Mel Brook’s movie, a frap and a chocolate muffin, only, hark, I must tend to a couple of things first. I do so and return to find my chocolate muffin wrapper laying open on the floor and NO MUFFIN! The last chocolate muffin in all of Bolivar and the dog ate it! I hope he gets indigestion. No "Random Stuff" coz I've been too busy with the book to generate any.